Excellent stuff. Just seeing that cover brings to mind all kind of memories. I remember how much of the time spent around table playing the AD&D was spent planning - where to go next, what to bring, what to do when we go there. Then planning how to divide the treasure, what magic items to take, what door to open next. The ratio of talking about what to do, to actually doing it, was definitely in favor of the talking. I compare it to the last session of 4e I played... and there is no comparison. I look forward to you analysis of the subsequent books - all of which seem unable to match the evocative work of that first AD&D PHB. I love Tramp's work, and yeah, that cover is great. 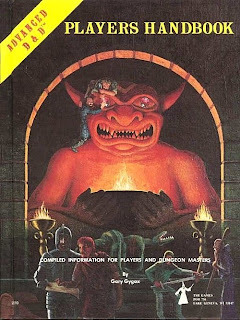 Reading this it struck me how--once AD&D was out--(classic) D&D no longer had very much "dark" artwork. Don't get me wrong. I love a lot of the D&D artwork. I think Bill Willingham might be my favorite of all the artists who did business with TSR. But there seems to have been a definite effort to keep the D&D art lighter than the AD&D art. This may be a bit simplistic, but to my artistically untutored mind, the defining trait of old school RPG art has always been that it triggers my sense of wonder and mystery. In other words, whatever situation is depicted poses more questions than it answers. The original PH cover is a prime example, as you indicate. This heuristic device serves me pretty well for explaining to myself the common appeal of most Dee, Otus, Holloway, Trampier, Sutherland, etc. pieces, as opposed to those of Elmore, to name my least favorite D&D artist. Almost none of Elmore's artwork fits the bill. The only question I ask myself when looking at one of his scantily clad elf princesses is why the heck they all have feathers in their hair like Cherokee braves :). Same sort of thing goes for Easley, Caldwell, WAR, et al. IMO. Nothing is really left to the imagination, even when the style itself is not objectionable (like Easley's stuff in S4, which is quite good but not thought-provoking). "Old schoolness" almost seems to be inversely proportional to stylistic refinement, as if the latter artists are spending more time worrying about polished execution than the composing the subject itself. After the PH cover, my personal favorite is Erol Otus's cover for Dragon #55. What the heck is that betentacled thing? why is it just sitting there drooling? why is the little creepy dude showing it so proudly to the fighter-type? did he create it? is it his maiden aunt? is it friendly? is the fighter going to take a swing at it? or is it thing going to eat them? I'm going to have to disagree. Otus's cover for the 1981 Basic D&D rulebook had all the elements: A mysterious dungeon, a fierce dragon, a brave warrior, a beautiful sorceress, glittering treasure. Plus, it was a lot more dynamic and eye-catching, IMHO. I love Erol Otus. I think he's an under-appreciated genius of mood. However, his work has a phantasmagoric feel that works best as a counterpoint to more "traditional" illustrations. As a kid, I used to find Otus' work "scary" or at least unsettling. I think that's a good thing. Fantasy should be scary. However, scary isn't the default feel for pulp fantasy, nor should it be. The Moldvay Basic cover isn't scary, but it is weird. It has iconic elements, but they're all rendered slightly off-kilter from expectations. That's good but, again, it shouldn't be the default. All of this is to say that, while I do indeed love the Moldvay Basic cover, I don't think it's as exemplary of D&D as Tramp's work. It captures all that is best in D&D. It's a tough choice between the cover of the Moldvay Basic book by Erol Otus and the Tramp PHB cover, but I have to go with the PHB. When I think back upon my first "discovery" of the game, I remember stumbling upon the books in a glass case at a toy store. They were inaccessible like a precious gem and all I could see was their covers and some strange dice sprinkled about... What is that? What does it mean? What a mystery! Tramp all the way! There was one cover with a party standing outside at the entrance to a cave, with a burly-looking fighter dude reading a map with one hand and preventing a gnome wizard from walking away by grabbing his collar with his other hand. Can't remember where that came from but it was definitely one of my faves.